We would like to take this opportunity to invite you to the Lylewood Christian Camp Spring Retreats! The theme for the retreats this year is “Strength in Numbers.” We will be examining how important Christian relationships and friendships are to our life and our spiritual walk with God. The Bible is replete with examples of godly friendships from David and Johnathan, Ruth and Naomi, to Paul and Timothy. God never intended for us to live our lives alone, in fact, God not only wants us to have godly friends, he expects us to do so. There is nothing more needed in life than good friends and family to support us, lift us up and to hold us accountable. Come learn how we can all be better together and have a great time while doing so. Come and join us for a weekend of fun, food, study, and FRIENDS. Camper Regisration is Only $45, but keep reading.. The Spring Retreats have traditionally been “Bring a Friend for Free” and this year is no exception. 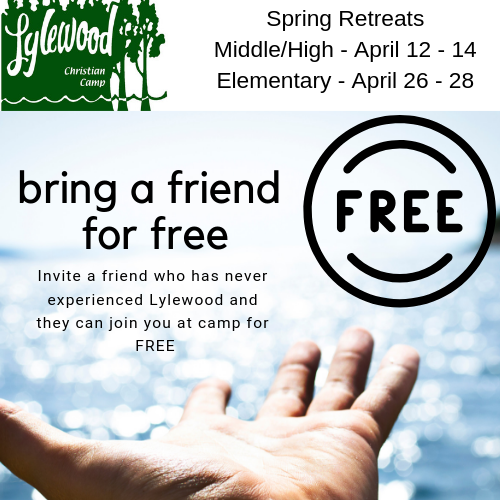 Invite a friend who has never experienced Lylewood and they can join you at camp for the weekend for FREE. We will have fun, while we study how to build, maintain and expand our Christian relationships. Don’t have someone to invite? Then by all means, come and make some new friends at Lylewood. You’ll be glad you came. Ecclesiastes 4 tells us Two are better than one, because they have a good return for their labor: If either of them falls down, one can help the other up, But pity anyone who falls and has no one to help them up.